On 13th November 1834 the 80-year-old French diplomat, Charles-Maurice de Talleyrand, retired from his final post, as Ambassador of France to Great Britain, thus drawing to a close one of the most remarkable such careers of all time. When one thinks that Talleyrand survived, as a high-ranking government officer, through some of the most turbulent years in French history - from monarchy to revolution to despotism and back again to monarchy - the story becomes even stranger. The Kipling line “if you can keep your head when all about are losing theirs” would seems to be entirely appropriate to describe Talleyrand, both figuratively and literally. He first emerged into public recognition as a bishop in pre-Revolutionary France. He was elected as a clergy member of the National Assembly but soon declared his sympathies as belonging more with the Third Estate (the people) than the First (the clergy). He became known as the “Bishop of the Revolution” and was drummed out of the Church as a result. Despite his republicanism he was entrusted by King Louis XVI to act as his envoy to Great Britain in 1792, but while he was in Britain the French monarchy fell and Talleyrand reckoned that a return to France would be too dangerous. He therefore fled to the United States for two years. When he felt that it was safe enough to do so, he returned to France and became Foreign Minister of the Revolutionary government at a time when France was at war with much of the rest of Europe. He continued in office under Napoleon Bonaparte, demonstrating considerable skills in brokering peace deals after Napoleon’s numerous victories. 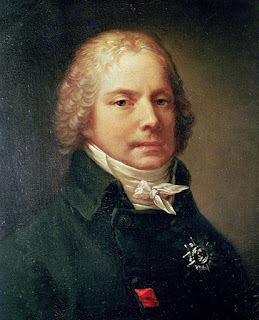 However, after 1812 and Napoleon’s failure to conquer Russia, Talleyrand saw the way things were going and began secret negotiations with France’s enemies to prepare the way for a restoration of the monarchy in France after the inevitable fall of Napoleon. Talleyrand was therefore instrumental in bringing Louis XVIII to the throne of France in 1814 (he was restored in 1815 after Napoleon’s “100 days”). Louis responded by making Talleyrand his Foreign Minister and representative at the Congress of Vienna. Talleyrand’s revolutionary past was too much for some of the ultra-royalists at Louis’ court, and he was forced out of office, supposedly for good as he was now nearing 70. However, there would be another twist in the tale after Louis was succeeded by the utterly unsuitable King Charles X. Talleyrand recognised that Charles was a reactionary bigot who was in grave danger of inciting another revolution. Talleyrand famously remarked that “the Bourbons have learned nothing and forgotten nothing”. He therefore began another round of scheming, this time to ensure that, after the 1830 revolution that Talleyrand had predicted, the next monarch would be far more liberal, this being King Louis-Philippe. Talleyrand was thus able to gain his final appointment at the hands of the new king and continued in office until he chose to retire. He died in 1838 at the age of 84.